Hull City season card holders have narrowly voted in favour of owner Assem Allam's plan to change the Premier League club's name to Hull Tigers. The Football Association will decide on the proposals when its council meets on Wednesday, though its membership committee has already made a recommendation to reject the plans. A total of 2,565 of those eligible voted for the change, to 2,517 against. 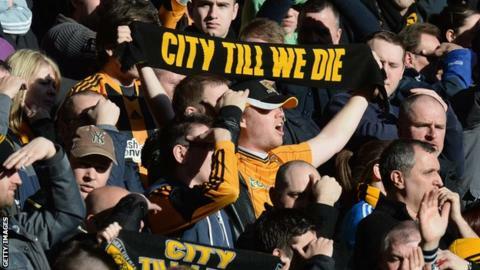 Fans' group City Till We Die said the result was "largely meaningless". Of the club's 15,033 season card holders, 5,874 responded, with 792 voting they were "not too concerned and will continue to support the club either way". Those in favour voted "Yes to Hull Tigers with the Allam family continuing to lead the club" while those against voted "No to Hull Tigers". Allam, 74, has said he will walk away from the club if the name change is blocked. The Egypt-born businessman believes a Tigers brand will be more marketable, and said he considered the word City to be "lousy" and "common". In a statement, City Til We Die said: "The truth of the matter is that this result is largely meaningless, either as a true measure of opinions regarding the name change proposal, or the supporters' desire to see Dr Allam and his son Ehab stay." It said there were "yawning deficiencies" in the ballot, including the "loaded nature of the questions". In August, it was announced the name of business that runs the club had been changed to Hull City Tigers. Four months later, the club applied to the FA to change its name to Hull Tigers from next season. Allam, who moved to Hull in 1968, took charge of the club in December 2010 and last season oversaw promotion to the top flight for only the second time in the club's 109-year history. He is credited with rescuing the club from administration but has been at odds with many supporters over his plans to change the club's name. Allam said in a newspaper interview last year that his opponents could "die as soon as they want", with manager Steve Bruce later claiming the owner had been misinterpreted. Hull are 12th in the Premier League and will reach the FA Cup final for the first time on Sunday if they beat League One side Sheffield United in their first semi-final since 1930.